Paper Crafter Anonymous: Double the Stamps in July! Double the Stamps in July! 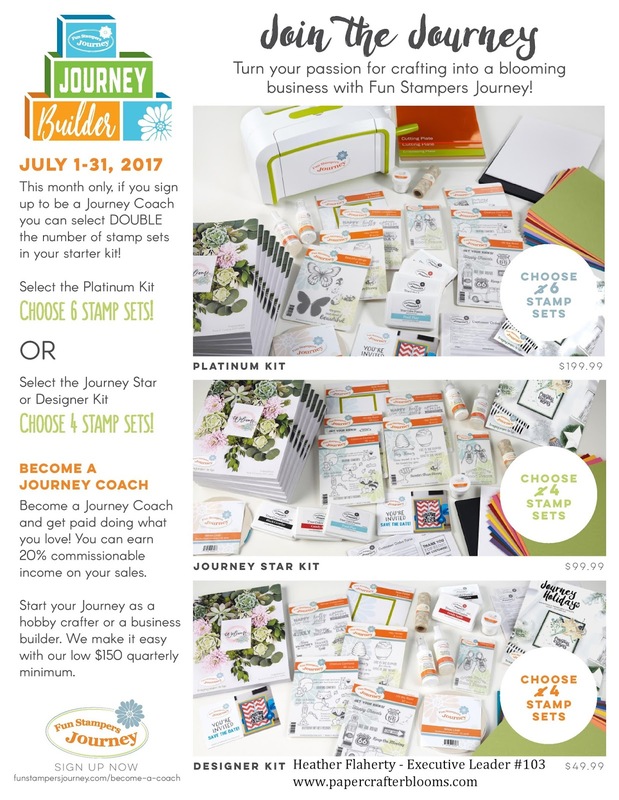 Sign on in the month of July and receive DOUBLE the stamp sets in your starter kit! You choose the starter kit that fits your needs and receive double the stamp sets! To get in on these great deals and join my team go to my website: www.papercrafterblooms.com and click on Become a Coach across the top; then click on Sign up and get ready to have some fun!!! Don't miss the Journey Blog Hoppers "Bringing Paper to Life" Blog Hop featuring new product from the 2017-2018 Catalog & Idea Book. Over 300 pages of yumminess! Fun Stamper Journey Coaches will be sharing their passion for crafting and alot of awesome NEW yumminess with all of you. Hop on by July 15th! Share the Blog Love!